Rich grew up lake fishing beginning shortly after learning to walk. Ocean spear fishing while in High School came next and then sport diving with SCUBA from Morrow Bay to the Channel Islands in Santa Barbara. The opportunity to try out a new fishery called “Urchin Diving” opened up in 1979 and his Dive Certification Card got him the temporary position. 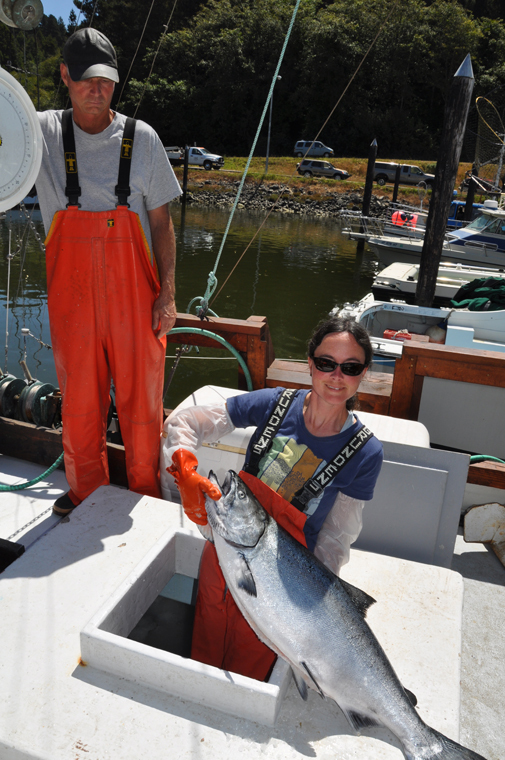 This was a six month stint while the owner of the boat waited for salmon season to open. After spending time as a Certified Welder then CATV technician the same Captain called him in Colorado offering a position of running his boat half time, once again Sea Urchin Diving. He jumped on it and realized within a few months it was time for his own boat. 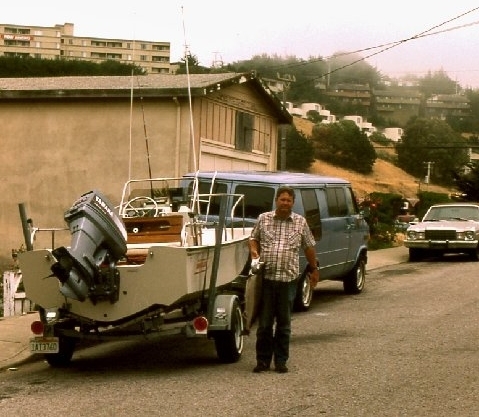 1985 began a full time commercial fishing lifestyle. Sea Urchin Diving continues today, although mostly in the winter months. In December of 2003 he and Laura Miller teamed up and bought the fishing vessel “Animal Fair” with the intent to enter the California Salmon fishery. Laura having tended sea urchin for the prior 3 years on his urchin boat knew what she was getting into, or at least some of what she was getting into. Sea Urchin fishing along the Mendocino coast is very close to shore and one can pick their days. Salmon fishing can catch you off guard and offers an entire different set of experiences. Neither had any prior salmon experience so the learning curve was a little grueling. A few of the experienced fishermen in the harbor offered advice but it didn't always make sense until going through the motions at sea. They tangled a lot of wire, lost fish behind the boat, snapped off expensive leads, wrapped lines around each other and the list goes on. He and Laura survived the transition from Captain/Crew to Co-Captains while learning a new trade. Through the years they honed their fishing and partnership skills to become the organized team they are today. Laura’s boyfriend, Brent, encouraged them into marketing and selling their own fish off the boat in 2005. His confidence in what they could do led them to where they are now. Collecting e-mails from the beginning and a three hour wait in line to buy fish led Laura to find a better way and their internet system came into life. With Brent's help she developed the on-line ordering system used today. Making a living on the Sea is a challenge and a lifestyle. This is a choice that takes a certain stamina, mindset and stubbornness only a few care to partake in. A quest for adventure and being ok with the lack of a schedule (and sleep) helps. While life on the Sea isn't for everyone, Rich and Laura have found a place of wonder and adventure, albeit at times quite scary. The rewards however are many, not the least of which, having the ability to bring a wonderful product to the local community. This they hope will continue for quite some time. Laura grew up in Pacifica, California. Her mother was an active volunteer, particularly in the library at Laura and her brother Peter’s elementary school, and her father worked in the taxi industry. They all traveled together extensively during the summers in their Chevy camper van throughout her childhood. Laura was especially inspired by the arts and crafts she observed on their road trips through Mexico and Alaska. At age 19 Laura moved to Santa Cruz, where her skills as an artist and craftsperson led her to begin a career in the fiber arts. She worked at a yarn store which emphasized natural fibers and handicrafts and was owned by a brilliant and patient teacher. There she learned knitting, spinning, weaving, natural dyeing, and dollmaking. She also worked at a friend’s art gallery and at home weaving fabric for a successful local artist who created beautiful handwoven jackets and purses. Her path took an unexpected turn when she moved to Mendocino and had the opportunity to work as a deckhand on her friend Rich Holmes’ sea urchin boat. She had spent quite a bit of time on the ocean sport fishing and joy riding in a Boston Whaler sport boat with her Dad as a child, and she knew she had the stomach and enthusiasm required. One thing led to another, and before long Laura and Rich invested in the salmon troller the F/V Animal Fair. They have been working together now for 14 years, their friendship withstanding all of the hard work and decisions required when making a living in such an unpredictable industry. 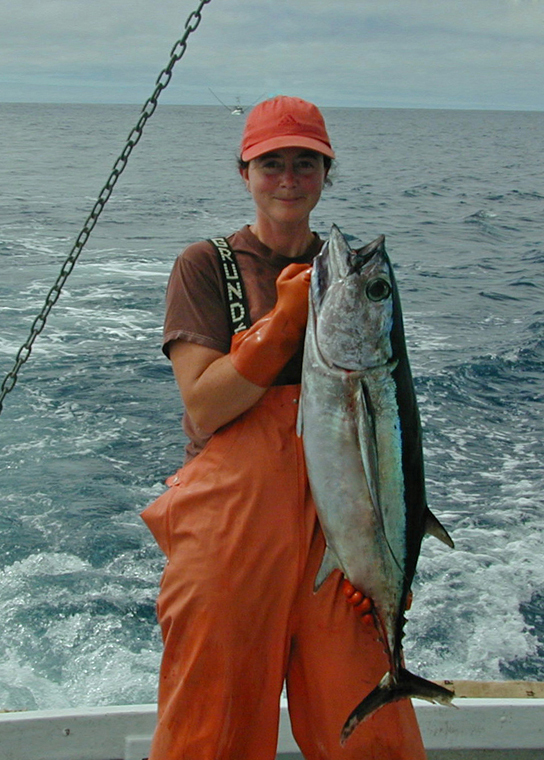 Winter tends to be pretty rough on the ocean, and sometimes fisherman have to find a “land job” to stay busy. 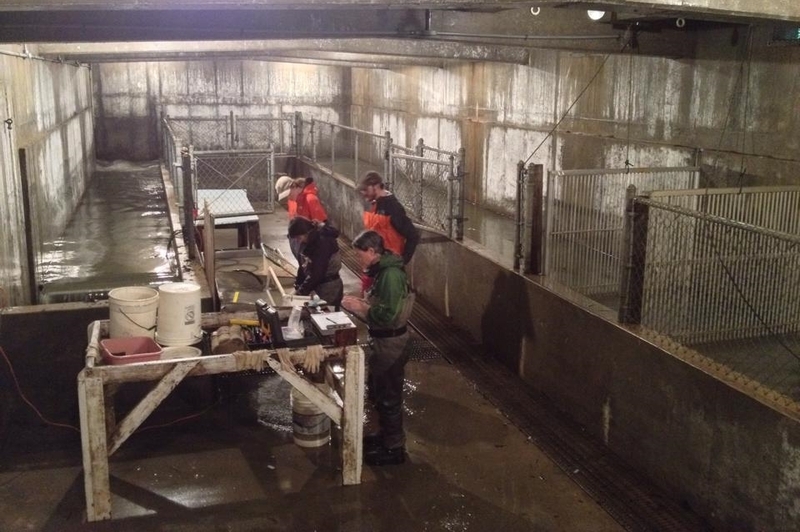 Laura’s experience with salmon and willingness to work outside in challenging conditions landed her a job as a field technician conducting salmon spawning surveys in the Pudding Creek watershed with Campbell Timberland Management. 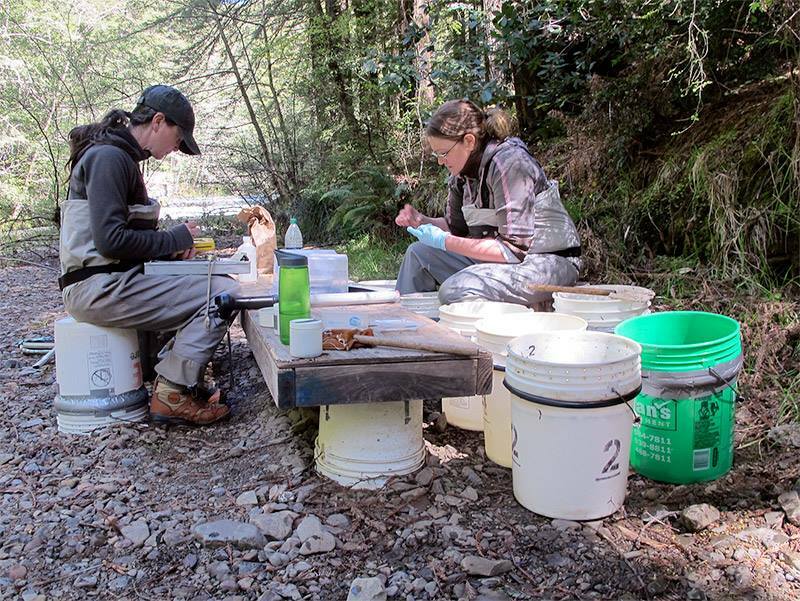 She later continued surveying as a crew member with Fish and Wildlife and has spent a total of eight winter seasons observing the salmon spawning on the Mendocino Coast. Laura’s craftsperson skills still come into play as she and Rich continually rebuild and maintain the Animal Fair. She enjoys her role on the regional spawning crew helping to design, maintain, and build various custom trapping projects. She also spent a couple of winters working as an assistant to a local artist and toolmaker, helping him produce his beautiful handmade tools for fine woodworking. Laura enjoys creating handmade gifts for friends and family when time allows, especially on cold rainy days, accompanied by her boyfriend Brent and their cat Dashi. Brent is a classically trained Chef and food enthusiast in general. He has taken part in professional and/or recreational harvesting of many local resources including wild mushrooms, sea vegetables, rock fishing, and foraging of edible plants on the Mendocino Coast. He also raises Heritage Rabbits and Chickens and enjoys kitchen gardening. He is currently enjoying his work at Roundman's Smokehouse in Fort Bragg. He has been instrumental in encouraging us to market our seafood to the community throughout our entire seafood sales experience. He did an excellent job of sharing our sea stories and sending out our sale announcements for many years. We appreciate his motivational assistance often when we're fishing hard at the height of the salmon season!